In the medium term, the loan waivers will leave very little fiscal space for capital expenditure and will affect capital formation efforts and growth. The budget presented by Arun Jaitley on February 1, 2018 is much talked about for its focus on agriculture and the rural economy. There have been some huge announcements to address the latest issue of rural distress. Government has decided to implement MSP for all crops; also, MSP has been hiked to 1.5 times of production costs. Various measures have been announced to increase farmers’ access to more credit facilities, along with improving market access for them so that they get better prices. The Finance Minister said the loans to self help groups (SHGs) increased to about Rs 42,500 crore in 2016-17, growing 37 percent over previous year and expressed confidence that loans to SHGs will increase to Rs 75,000 crore by March, 2019. He also substantially increased allocation of National Rural Livelihood Mission to Rs 5750 crore in 2018-19. In the year 2018-19, for creation of livelihood and infrastructure in rural areas, total amount to be spent by the Ministries will be Rs 14.34 lakh crore, including extra-budgetary and non-budgetary resources of Rs 11.98 lakh crore. Apart from employment due to farming activities and self-employment, this expenditure will create employment of 321 crore person days, 3.17 lakh kilometers of rural roads, 51 lakh new rural houses, 1.88 crore toilets, and provide 1.75 crore new household electric connections besides boosting agricultural growth. But let us drive our attention to the all-important target of doubling farmer income by 2022. Devendra Fadnavis declared a farm loan waiver in Maharashtra on June 24, 2017. The sop was estimated to cost the Maharashtra exchequer around Rs 34,022 crores. The loan waiver covered benefits for around 6.7 million farmers according to the data shared by the State Level Bankers’ Committee (SLBC). The move has pushed up the fiscal deficit to 2.71 percent of gross state domestic product (GSDP) in fiscal 2018 as against the budgeted 1.53 percent, according to rating agencies. In the medium term, this move leaves very little fiscal space for capital expenditure and will affect capital formation efforts and growth. In a struggling economy there is a likelihood that government will have to sustain spending, putting further burden on the treasury. Maharashtra being a manufacturing state continues to face tax revenue uncertainty in the ongoing GST regime which will adversely affect fiscal management. According to a report by Bank of America Merrill Lynch, there is an increased chance that other states would follow Maharashtra in launching waiver programmes as we inch closer to 2019 general elections. This will create a scenario where state governments could write off loans worth $40 billion, which is around two percent of India’s GDP. 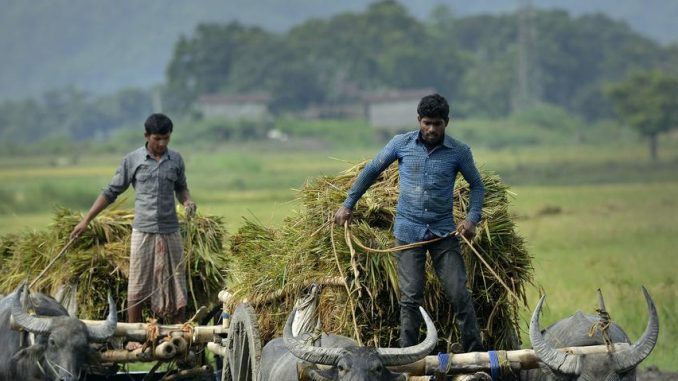 The recent economic survey states that farm incomes may reduce by up to 15 to 18 percent at least, due to reasons such as climate change and price fluctuations. This situation is also accompanied by falling rural wages, lower profits and increasing indebtedness among farmers giving rise to rural distress. Historically, Indian agriculture sector suffers from low productivity because of low technological adoption. The problems are further compounded because there is little awareness of the quality input side and ever-increasing imports. The government’s own data from the Commission for Agricultural Costs and Prices (CACP) shows that farmers earned only about 6.7 percent return over costs (based on minimum support price) on paddy and only 0.7 percent for pulses like moong for the 2016-17 period. Numbers for other crops are equally dismal. Another coincidence has been the implementation of nationwide goods and services tax in July which hurt supply chains throughout India at the peak of rainy season, when prices of vegetables and grains were expected to rise. One of the best ways that have been suggested to address this dire problem is to view agriculture as an industry. Taking a leaf out of US and UK policy books, government can promote new technology to increase productivity and subsidies to push agricultural exports. Making agriculture competitive and farmer friendly can go a long way in promoting stable incomes for farm-dependent families rather than frequent loan waivers. The main reasons of low productivity are small land holdings that make it difficult to automate processes; little or no agricultural innovation and expertise; expensive seeds, and other factors. This has led to Indian farmers falling behind in competition. In 2017, the three main groups of agricultural imports were edible oil, pulses, and fruits such as apples, kiwis, etc. India has perfect climatic and soil conditions to grow them on a large scale. The problem of falling incomes can be eradicated by making farmers more entrepreneurial and providing them with instruments to control the outcomes of their activities. A collection of measures on both price and non-price fronts need to be taken. As part of improving the quality of inputs, there has to be a liberal distribution of fertilisers and quality seeds to farmers at the right time and at reasonable prices. The present efforts to bring more land under irrigation also have to speed up to accommodate growing demands. Co-operative farming is a solution which can distribute risks and increase productivity while ensuring better access to credit. On the other hand, corporate farming ventures is also a solution that can ensure stable income for farmer families by outsourcing risks to corporates who also supply expertise, bring in technology and in some cases also buy the products. CFVs take lands on lease from a group of farmers and pay an agreed amount and a share of profits. Creating more knowledge centres at village level, where farmers can in person attend seminars can go a long way in inculcating a disciplined way of farming. Large agricultural universities and institutes can lend their time and resources for the knowledge transfer seminars. Innovative ways to connect farmers to markets and consumers should be invented. Platforms such e-National Agriculture Market (NAM) have to backed by all stakeholders to fully support farmers. Frequent loan waivers are unsustainable and counterproductive in the long term because they don’t ensure a healthy credit culture. The way forward to improve agricultural incomes is to systematically create a healthy ecosystem which helps farmers empower themselves.